does anyone remember the name of a tv show (that was either on national geographic, history channel, or similar channel) about 4 or 5 years ago that would spotlight different weapons in history and how they were used - i.e. the viking axe, the hebrew slingshot, various swords, flail weapons, and how they would be used against another style of weapon in combat, THEN he would instruct a group of people how to use the weapons and they would fight. the host was british and is bald and he has hosted a few others shows since then. i was hoping it would be on youtube. The show was called "Conquest", starring host Peter Woodward. It aired on the History Channel from 2002 - 2003. "I thought what I'd do was, I'd pretend to be one of those deaf-mutes." Yeah, "Conquest" seems to match the given description best. It was fun but got a bit goofy at times. Personally, I preferred the 5-part "Weapons that Made Britain" with Mike Loades. He also says some goofy stuff, but is very enthusiastic. I have moved this topic to the Off-topic Talk forum. "Discussions of general history and other miscellaneous topics relating to arms and armour that do not specifically fit our other forums"
I have worked with both Peter and Mike; Peter when Conquest was going and Mike more recently with his new show Weapons Masters. Mike comes from an weapons history background and Peter comes from a stage combat choreography background. I found Mike to be far more knowledgeable of the field. Peter seems more of just an actor, but he did appear to have an appreciation of better arms and armour. 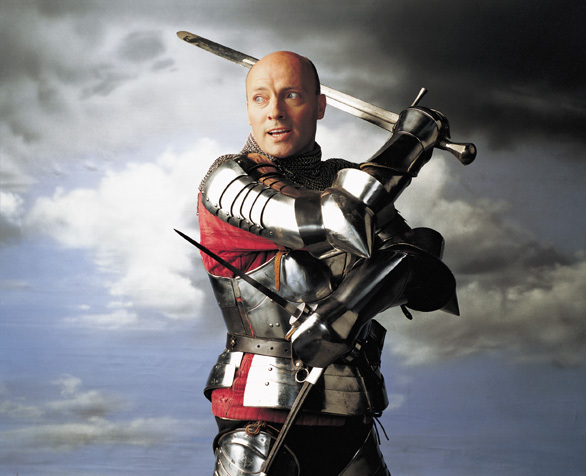 Here's Peter in my armour, from a photoshoot done to promote Conquest. I think the photo was used on billboards around LA.